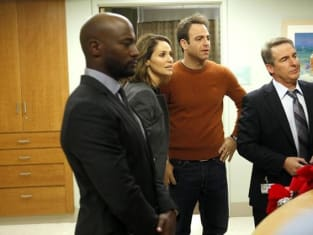 It’s hard to believe that we are now only a week away from the final Private Practice episode ever. Although we’ve had plenty of time to prepare, it’s just now finally sinking in for me. "Full Release" reminded me just how much I am going to miss our favorite doctors. The second-to-last episode was full of drama, centering on Charlotte finally going into labor with the rest of the Cooplets. 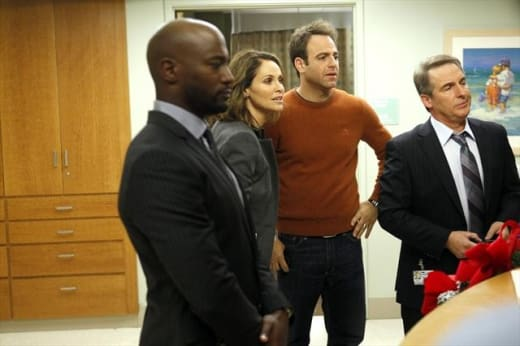 Unlike most of Private Practice Season 6, the penultimate episode wasn’t character-centric by any means. In fact, every character’s storyline was intertwined delivering one heck of an installment. First, let’s welcome Rachel and Caroline to the world, as they join their sister, Georgia. The Freedmans just doubled in size, and I definitely couldn’t be happier for them. They now even have a dream house that will be just perfect for their suddenly big family. I thought the scenes with nearly ever doc spending a few minutes with Georgia were incredibly special. Although Charlotte’s delivery was terribly intense and scary, KaDee Strickland nailed it and I loved the way Cooper and Amelia cheered her on and how awe-stricken everyone was once the babies all arrived. Elsewhere, Addison received awful news at Henry’s adoption hearing after the judge decided that the adoption couldn’t be finalized because of a recommendation from the social worker. Based on Jake’s history and what happened recently with his daughter, the social worker was concerned for Henry’s safety. In some ways, I couldn’t blame Mildred, as she was only worried about Henry. However, like Addison said, Mildred simply just didn’t know Jake. Luckily, Jake saved the day and went straight to the judge’s chamber to set things straight and tell the judge exactly what kind of a father he is, and how he’d walk away from Addison to allow Henry to be with his mother if needed. In the final minutes, Jake delivered the good news that Henry was finally Addison’s and the two decided that it was time to get married. Meanwhile, Sheldon introduced Miranda to Violet. He told Violet they met at a vending machine and left out the details about cancer and treatments. I’m torn over Sheldon’s storyline; it’s so nice to see him get a shot at happiness, but to know that Miranda is dying just makes me feel bad for Sheldon all over again. Eventually, she did convince him to tell his friends about their situation. She wanted to make sure that Sheldon would be all right after she was gone, and he took her advice and shared what was going on with him with Sam. This was a major step for Sheldon, who has always been so private with his life and we’ve hardly gotten to know him. I had to pause my DVR to check out the list of names that everyone came up with. Here were a few: Eve, Juliette, Raquel, Grace, Autumn, June and Matilda. I think Charlotte, Cooper and Mason did just fine without the list. I really appreciated the scene with Sam and Violet as Sam told her that her life was still unfinished. She was feeling so down, and I’m glad that Sam said the right words to make her realize that she still had much life to live. By the way, do you think it’s possible that we’ll see the bookstore owner again as maybe Violet’s date next week? Amelia was awesome once again as she helped Charlotte during a very painful moment. It’s great that she has James now and that she realized she still wanted children after meeting the Cooplets. She deserves some happiness. Don’t forget to check out the Private Practice quotes as Charlotte once again was perfectly hilarious. What did you think of “Full Release?” Were you worried for Charlotte during her delivery or Addison during Henry’s hearing? And what are your expectations for the series finale? Lastly, how are you going to fill your Tuesday nights after Private Practice ends for good next week?! ?